For enhancing immunogenicity and develop vaccine strategies using peptide based constructs against HIV-1, a chimeric peptide containing V3 loop and transmembrane sequence of gp41 with two glycine motifs as spacer was constructed. The V3-gp41, gp41 peptide and p17 and p24 peptides separately or in a cocktail were entrapped with or without MA729 as an immunoadjuvant in liposomes or ISCOMs. The immunogenicity, antigen induced T-cell proliferation and cytokine profiles of various formulations were studied in four different inbred strains of mice of H-2d, H-2b, H-2k and H-2q haplotypes, keeping alum as a control adjuvant. Both liposomes and ISCOM preparations elicited high titer and long lasting antibody response (60 days and above). When compared to the alum formulation, the liposomes co-entrapped with MA729 produced high antibody levels, comparable with that induced by ISCOMs. Peptide in alum, liposomes and ISCOMs enhanced both antigen specific IgG2a and IgG2b isotypes and high T-cell stimulation index. Peptide formulations also induced antibodies with high affinity and in vitro neutralizated the formation of HIV-1 syncytia. T-cell supernatants contained high levels of IFN-γ and IL-2. Thus formulation in these adjuvants induced a predominant Th1 like response with MA729 as a versatile novel delivery vehicle for stimulating the appropriate arm of the immune response that can selectively modulate MHC class I or MHC class II response. The above peptide can be of wide vaccination interest as a means to improve immune responses to several other HIV-1 antigens and may serve as candidates for vaccine development. An important consideration for the development of a synthetic vaccine against acquired immunodeficiency syndrome (AIDS) is the use of an immunogen incorporating selected B-cell and T-cell determinants [1–3] thereby inducing potent and specific neutralizing antibodies against HIV, rather than whole virus or viral subunits, which are known to elicit adverse immunosuppressive, immuno enhancing and autoimmune responses [4, 5]. Epitope based strategies representing selected sequences has been developed as a result of understanding the mechanism of antigen recognition by B and T cells following its association with either MHC class I or II molecules. Several methods have been attempted to make weak peptides more immunogenic following co-polymerization, covalent linkage, or collinear synthesis to a Th cell peptide, synthesis of longer constructs such as multiple antigenic peptides or of hybrid multiple epitopes [6, 7]. Although these approaches elicited satisfactory humoral response but variability in antibody response among diverse genetic individuals has limited the applicability of peptide based vaccines. Novel mode of vaccine delivery relies on controlled release technology and to some extent timed-release delivery of antigen to mimic booster immunizations. Recently, adjuvants have been shown to strongly augment cellular responses to peptide antigens [8–10] by selective induction of Th1 type of response. A number of antigens derived from HIV sequences together with various adjuvants have been tested in several delivery systems. Although they showed promising results, they are frequently associated with certain limitations such as toxicity, which makes them unsuitable in humans. Their choice therefore appears to be a crucial factor in determining the final outcome of the immune response. Presently known HIV-1 vaccine candidates although effective against some isolates, are not effective against naturally occurring virus isolates . The major targets for neutralizing antibody and focus of most of the studies are the envelope glycoprotein. The V3 loop domain (derived from gp120) forms a major component of most of the subunit vaccines, which has shown to block HIV infection in vitro  as well as in vivo . In the present study four immunodominant peptides were selected using hydrophillicity plots from HIV encoded gp120 (V3 loop), gp41, p17 and p24 proteins representing conserved domains. Mice with different genetic backgrounds were selected to look whether; there is a generalized pattern of immune response in all the strains with diverse genetic makeup so as to correlate the response with outbred population. A safe and effective approach adopted is the inclusion of non-toxic, permissible adjuvants like MA729 (MDP analog). The pattern of antibody and T-cell response seen in these strains is an indicative of a predominantly CD4+ Th1 type of response. Moreover peptides derived from different antigenic region of HIV elicit antibodies that are able to neutralize laboratory-adapted virus in vitro. Our data demonstrate that V3-gp41 peptide in liposome with adjuvant MA729 gives the best antibody response. Peptide primed lymphocytes proliferated efficiently in response to soluble synthetic peptides of HIV, delivered in liposome's (alone or in presence of an adjuvant MA729) or in ISCOMS. T cell proliferation and cytokine response to liposome and ISCOMS associated antigens demonstrated enhanced stimulation of lymphocyte proliferative responses with induction of Th1 like cytokines i.e. IFN-γ and IL-2. Thus an attempt has been made to produce and develop an immunogen for generating of high titer and high affinity cytophillic antibodies using novel delivery systems. 6–8 weeks old BALB/c. H-2d, C57BL/6J H-2b, FVB/J H-2q and CBA/J H-2k were obtained from breeding facilities of National Institute of Immunology, New Delhi. Each experimental group consisted of 4–6 animals. MDP analog (MA729) was the product of CDRI (Central Drug Research Institute). 1. V3-gp41 – combination of V3 loop (308–322) and gp41 (593–604) sequence bridged with two glycine motifs. 2. gp41 (728–753) – (DRPEGIEEEGGERDRDRSIRLVNGSL). 3. p17 (114–136) – (KKAQQAAADTGNRGNSSQVSQNY). All the peptides were synthesized using t-Boc chemistry on PAM resin by the method of Merrifield . The resulting peptides were purified using HPLC and characterized by amino acid composition and homogeneity of the peptides were assessed by various analytical techniques. All the peptides were found to be > 95% pure. Liposome's were prepared according to our reported protocol . Briefly multilamellar vesicles (MLV's) were prepared composed of phosphatidyl choline, cholesterol and phosphatidyl glycerol taken in molar ratio of 7:4:1. MLV's were probe sonicated to small unilamellar vesicles (SUV's). Peptide or peptide with adjuvant at 5 mg/ml was freeze dried with SUV's. After rehydration and suspending in PBS, liposomes were pelleted at 100,000 × g. The amount of peptide antigen entrapped within liposomes was measured using I125 peptide. The percent efficiency was found to be in the range of 25–30%. ISCOMs were prepared according to our reported protocol . Peptides were palmitified before entrapment into ISCOMs using the reagent N-Palmitoyloxy succinimide . ISCOMs containing peptide antigens were pelleted by centrifugation on sucrose gradient. The amount of peptide incorporated in the ISCOMs was estimated using colorimetric assay . The efficiency of incorporation was found to be 40–50%. The size, shape and morphology of the preparations were studied by TEM studies. V3-gp41, gp41, p17 and p24 peptide(s) alone adsorbed on alum or incorporated in liposomes (with or without adjuvant MA729) or in ISCOMs were used as immunogens. Each peptide was studied in all the four groups. Dose of 25 μg of peptide adsorbed on alum and 5 μg in liposomes was standardized to study the humoral response in all the four haplotypes. For every dose, four mice were used in a group for every haplotype studied. Whenever MA729 was included in the formulation, the amount of adjuvant i.e. 50 μg (optimal dose) was kept constant with 5 μg of all the peptide formulations. Mice were immunized in the footpad on days 0, 21, 35 and 42. Bleeds were collected on days 27(Ist), 42(IInd) and 60th (IIIrd). The third bleed was taken without a booster dose. Amounts of individual peptides in cocktail mixture followed identical immunization schedule as described above. Peptide specific antibodies were detected at fixed antisera dilution (1:100) as well as by measuring the peak (end point) titers. The peak titers were expressed and assessed as the reciprocal of sera dilution which gave an absorbance > 0.2 (i.e. ± 4 standard deviations from the mean values of pre immune sera). IgG subclasses were determined using the isotyping kit. Plates were coated overnight with 100 ng/well of peptides. Usual ELISA procedure was followed using goat anti-mouse IgG subclass monoclonal antibodies (Sigma isotyping kit) at 1:1000 dilutions for IgG1, IgG2a, IgG2b or IgG3. The respective peptide mice antiserum was used at 1:100 dilutions. Pre-immune sera were used as negative control. The binding affinity of antibodies of different antigenic formulations were determined by measuring the KD (dissociation constant) value using the reported protocol  in high and low responder strains of mice. Peptide antigen at various molar concentrations (1 × 10-7 M to 1 × 10-10 M) was incubated at a fixed dilution 1:500 of the respective peptide-antiserum. The unbound antibodies were then determined using an indirect ELISA. Scatchard and Klotz mathematical equation was used to calculate the KD value. AO / (AO-A) = 1 + KD / aO, AO = Absorbance without antigen, A = Absorbance with free antigen. aO= Free antigen concentration. The equation permits the determination of dissociation constant even if specific antibody concentration is not known. The equation is of a straight line and the slope determines the KD value. Human immunodeficiency virus (HIV) plaque assay was done with CD4+ expressing MT-2 cell line as described . This assay permits or works with anti-envelope antibodies and not with the core protein (p17 and p24) antibodies. All sera were heat inactivated before use. Virus and sera to be tested were diluted in 50% assay medium (85 % DMEM with 15% fetal bovine serum, 2 μg of polybrene) and 50% normal human plasma pools (NHPP). MT-2 cells were added to each well and incubated for seven days at 37°C in 5% CO2 and stained with propidium iodide. Representative peptide antisera that showed peak titers in a given haplotype with a given formulation were used for the HIV microplaque assay. The neutralizing titer of each serum sample was expressed as the inverse of the greatest dilution of serum, which resulted in 50% inhibition in the average plaque count relative to the count in the control wells. The percent inhibition at each dilution was calculated using the mathematical equation was expressed as percent control. Peptide binding assays was done to check the crossreactivity of antiserum with different Clades or isolates of HIV. ELISA plates were coated with avidin subsequently blocked and then was incubated with 50 ng/well biotinylated peptides. Four fold-diluted antiserum was used from 1:100 to 1:6000. Titer of the antisera was defined as reciprocal of the dilution, which gave a mean absorbance of 0.5. To study the antigen induced T cell stimulation and to optimize the day of maximal T cell response V3-gp41 peptide adsorbed on alum was used to immunize mice of haplotype H-2d. 25 μg of peptide adsorbed on alum was immunized on day 0, boosted with half of the primary dose on 8th day and mice were sacrificed separately on 12th and 15th day. Separate groups of mice also received a booster on 12th day followed by sacrifice on 15th and 20th day. V3-gp41, gp41, p17 and p24 peptides were separately adsorbed on alum and immunized in four different mice of haplotypes H-2d, H-2b, H-2k and H-2q with 25 μg of peptide dose in primary immunization and 12.5 μg for subsequent boosters. A cocktail peptide approach was also studied in a high responder H-2b and a low responder H-2k with 25 μg of peptide equivalent immunized in alum, with half the primary dose for booster immunization. Mice spleen cells obtained after immunization with respective peptides in alum were in vitro stimulated with peptide alone or peptide entrapped in liposomes (with or without MA729) or peptide entrapped in ISCOMs as studied for four different strains. In another set of experiment V3-gp41 peptide was immunized along with MA729 and the spleen cells obtained were in vitro stimulated with peptide alone, peptide entrapped in liposomes (with or without MA729) or in ISCOMs. Moreover to look for the mitogenic activity of MA729, mice were primed with the adjuvant and the spleen cells were in vitro stimulated with MA729 (alone or in liposomes) and with V3-gp41 peptide alone or entrapped along with MA729 in liposomes. T cell proliferation was also studied using cocktail mixture of peptides adsorbed in alum and in vitro stimulated with respective peptides alone or entrapped in liposomes (with or without MA729) or in ISCOMs. Cells were cultured in triplicate and Conconavalin A 5 μg/ml was used as a positive control. Negative control consisted of unstimulated cells containing the media alone. Cells were cultured for 72h in a humidified chamber with at 37°C, 5% CO2. 50 μl culture supernatants were collected for estimation of IL-2, IL-4 & IFN-γ. The cells in each well were pulsed with 0.5 μCi of 3H (6.7 Ci/m mole) and incubated for 18 hrs. Thymidine incorporation was measured in a liquid scintillation counter (Wallac B-counter, counting efficiency 65%). The culture supernatants collected during antigen induced T-cell proliferation assay were used to measure cytokine levels (IL-2, IL-4 & IFN-γ). Culture supernatants were taken from wells pulsed with the optimal antigen concentration, which showed the maximal stimulation index, as assayed for different peptides. The culture supernatants obtained were centrifuged at 5,000 rpm for 20 min and filtered through 0.22 μM Millipore membranes and were quantitated using duo set ELISA kits (Genzyme Corp., USA) as per the manufacturer's instructions. Cytokines IFN-γ, IL-2 and IL-4 were measured in the culture supernatants obtained after priming with cocktail mixture in alum and in vitro stimulation with respective peptides alone or entrapped in liposomes (with or without MA729) or in ISCOMs. Levels of statistical significance (P) values for the difference in total IgG (in the sera raised against different antigen preparations) were performed by Non-Parametric Kruskal-Walli's one-way analysis of variance. For calculating the P value in respect of difference in isotypes, Non-Parametric Friedman's two way ANOVA with multiple range tests between the different formulations and Kruskal-Walli's one-way ANOVA between different IgG subclasses were applied. Levels of statistical significance between antibody levels in the first, second, third and fourth (bleeds except otherwise stated) were determined by Wilcoxson's signed rank test. The difference between the T cell proliferation and cytokine levels of peptide alone, peptide in liposomes (with or without adjuvant) and in ISCOMs were also analyzed using Non-Parametric Kruskal-Walli's one way analysis of variance by ranks. TEM studies revealed that the size of the ISCOMs and liposomes to be in the range of 40 nm and 300 nm respectively in diameter. 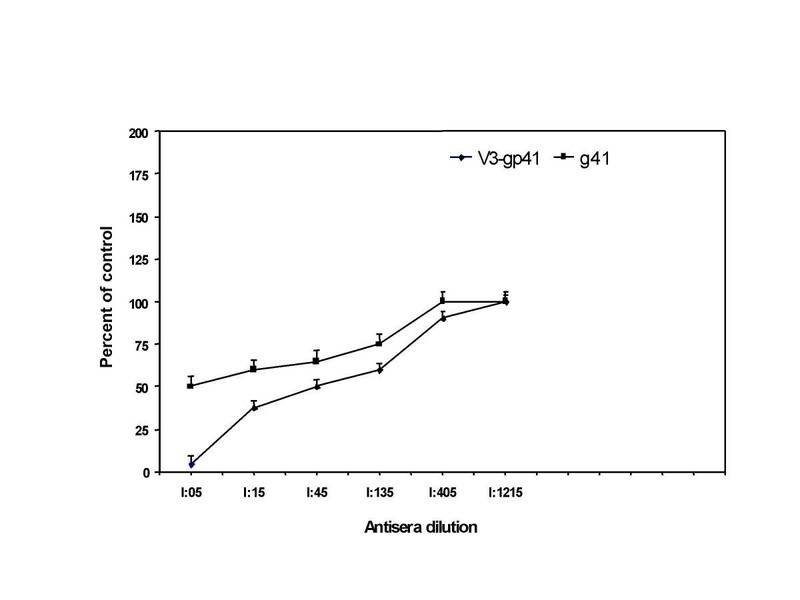 The amount of peptide antigen required to produce optimum immune response was standardized using V3-gp41 peptide and was found to be 25 μg, for first immunization and 12.5 μg for subsequent boosters for peptide adsorbed on alum (data not shown). For liposome and ISCOM preparations, the optimum dose that showed peak antibody levels was found to be 5 μg. Adjuvant combination of 5:50 μg dose of peptide: MA729 elicited highest antibody response, in a dose kinetic study. The above doses were fixed for subsequent immunizations with other peptide antigens in different haplotypes. Sera obtained from of mice of different genetic background with synthetic peptides in different formulations were assayed for peptide specific antibodies. The results show that all the peptides in alum were immunogenic in one or more of the strains of mice depending upon the nature of the formulation used. 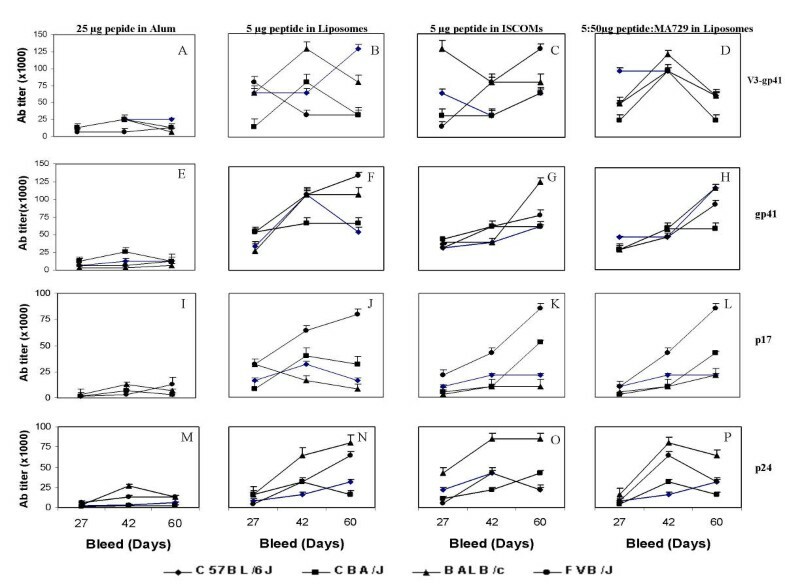 V3-gp41 and gp41peptides produced high titer antibodies and the peak titers sustained even in third bleed without booster immunization while the antibody titers for p17 and p24 peptides were moderate in all the strains (Fig. 1A,1B,1C,1D,1E,1F,1G,1H,1I,1J,1K,1L,1M,1N,1O,1P). Kinetics of antibody response and estimation of end point titers of murine antisera raised during course of immunization in different formulations for V3-gp41 (A-D), gp41 (E-H), p17(I-L) and p24(M-P). HIV-1 peptides. Mice were immunized as described in Materials and Methods in different antigenic formulations. The serum antibody titers were determined by ELISA. Titers were assessed as the highest sera dilution giving an absorbance of > 0.3. Highest sustained antibody titers (>60 days) were observed in all the strains with peptide entrapped alongwith MA729 in liposomes and were statistically significant (P < 0.05) as compared to the other formulations. For V3-gp41 peptide, the antibody titres obtained for mice bearing the haplotype H2b and H2d were higher as compared to mice bearing the haplotype H-2k and H-2q. Peptide: MA729 in liposomes showed the highest antibody titres in all haplotypes studied (Fig. 1A,1B,1C,1D). It is interesting to note that the peptide itself showed comparable peak titres of 1/102,400 in both liposome and ISCOM preparation except in secondary bleed of mice bearing the haplotype H-2 d&k with peak titers of 1/64,000. Secondary immune response for V3-gp41 peptide in liposomes (with or without adjuvant) generated similar peak titer of 1/128,000 in mice bearing the haplotypes H-2b. Comparable peak titers were observed for V3-gp41peptide entrapped in liposomes and ISCOMs except in the third bleed of mice bearing the haplotype H-2d&k. The antibody response in liposomes was 2–4 folds higher than the ISCOM based preparation. Although, liposome and ISCOM preparations showed slight strain-to-strain variation in antibody titers, the difference however was statistically insignificant. Peak antibody response with gp41 peptide was significantly higher (p < 0.01) in mice bearing the haplotype H-2d&k as compared to haplotype H-2b&q irrespective of the nature of the formulation used (Fig 1E,1F,1G,1H). The antibody response in liposome preparation for gp41 peptide together with adjuvant was highly significant (P < 0.01) with peak titers of 1/102,400 for all the haplotypes especially in the third bleed, when compared to alum preparation with peak titers of 1/32,000. The titers were significantly higher in liposomes and ISCOM preparation for all the haplotypes and in all the bleeds as compared to alum based formulation. Although all the haplotypes responded equally well, mice bearing haplotypes H-2b and H-2k showed the highest and lowest antibody titers respectively among the four haplotypes studied. P17 and p24 peptide in alum showed peak titers of 1/6,400 and 1/3,200 respectively (Fig. 1I,1J,1K,1L,1M,1N,1O,1P). All the p17 peptide formulations were immunogenic, but mice bearing the haplotype H-2q showed maximum peak titers of 1/51,200 followed by haplotypes H-2k (1/32,000), H-2b and H-2d(1/16,000) (Fig 1I,1J,1K,1L). High antibody titers were obtained when the p17 antigen was entrapped in liposomes (1/32,000) or ISCOMs (1/51,200). Addition of adjuvant MA729, improved the immunogenicity of the formulations with antibody levels statistically significant (P < 0.01) for p17 peptide in all the haplotypes. For p24 peptide, mice bearing the haplotypes H-2k,b&d showed peak titers of 1/25,600 in liposomes containing adjuvant, but mice bearing the haplotype H-2q failed to show similar response (Fig 1M,1N,1O,1P). Unlike V3-gp41 and gp41 peptide, the antibody response for p17 and p24 peptide was significantly lower and the pattern of antibody response obtained for different delivery systems was more or less same. Peptide (5 μg) in liposome (with or without adjuvant) and ISCOMs elicited antibody response, which was 3–4 fold higher in magnitude as compared to alum, based preparations. Humoral response to mixture of peptides containing equivalent of V3-gp41, gp41, p17 and p24 in different formulations were studied in high (H-2d) and low responder strain (H-2k) of mice (Fig. 2A,2B,2C,2D). When peptide specific antibodies were measured, delivery in alum showed lower antibody response as compared to other adjuvant formulations. For V3-gp41 peptide booster response was observed for all the formulations and was maintained till third bleed (Fig. 2A). gp41 peptide in liposome (with or without adjuvant) or in ISCOMs did not induce significant boosting effect in both the haplotypes however the levels of antibodies were maintained for all the formulations till the third bleed (Fig. 2B). p17 peptide showed booster response for both liposomes (with or without MA729) and ISCOMs formulations in both the haplotypes studied (Fig. 2C). Irrespective of the strain and the formulation, V3-gp41 specific antibodies were found to be predominant followed by p17, gp41 and p24 anti-peptide antibodies. Estimation of V3-gp41 (A), gp41 (B), p17 (C) and p24 (D) peptide specific antibodies generated by immunizing the mice with cocktail of HIV peptides. Peptide-specific antibody levels were determined by ELISA at fixed antibody dilution (1:100). Very low levels of anti p24 antibodies were observed for all the formulations in both the haplotypes. The levels of antibody for peptide entrapped in liposomes (with or without adjuvant) and in ISCOMs were statistically significant (P < 0.05) as compared to antibody response in alum formation. 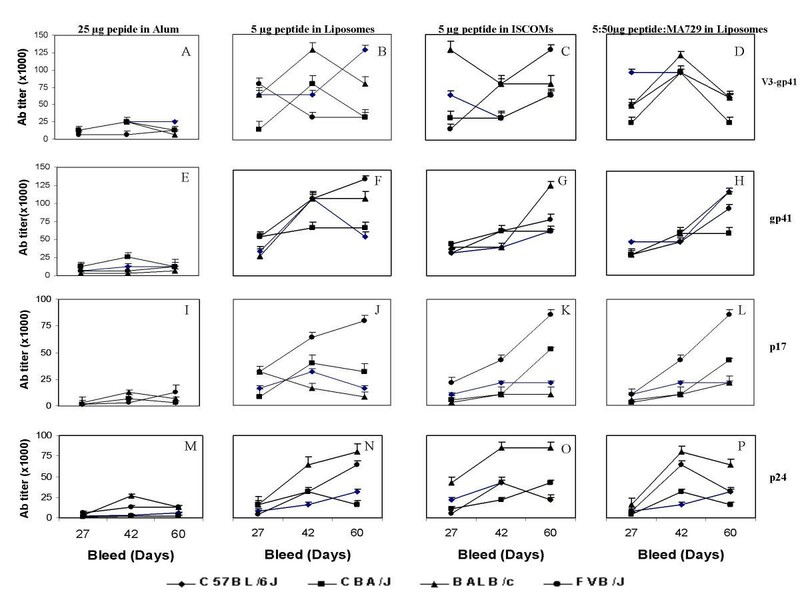 Mice immunized with peptide or peptide formulations predominantly generated IgG2a/IgG2b isotypes and the levels were comparable in all the bleeds and strains. The inclusion of adjuvant in liposomes formulation showed higher levels of IgG2a/2b subclass when compared to other formulations (Table 1). IgG isotypes for mice of different haplotypes (H-2b, H-2k, H-2q, H-2d). Estimation of IgG isotypes for different peptide formulations in mice bearing haplotypes H-2b(1A), H-2k(1B), H-2q(1C), H-2d(1D). Levels of IgG1, IgG2a, IgG2b and IgG3 and determined as described in Materials and Methods at fixed antisera dilution (1:100). IgG2a,2b,2c and IgG3 were determined using ELISA in all the three bleeds for all the four peptides in different antigenic formulations using the isotyping kit. The O.D. values represent mean ± SEM of sixteen mice (four for each haplotype) as studied for the bleeds obtained on 27th (I), 42nd(II), and 60th (III) day. IgG2a,2b,2c and IgG3 were determined using ELISA in all the three bleeds for all the four peptides in different antigenic formulations using the isotyping kit. The O.D. values represent mean. ± SEM of four mice for the bleeds obtained on 27th (I), 42nd(II), and 60th (III) day. Mice bearing the haplotype H-2d and H-2q induced higher levels of IgG2a and IgG2b isotypes compared to H-2b and H-2k (Table 1) irrespective of the nature of the peptide or formulations used which was statistically significant (p < 0.01) in both primary and secondary bleeds. Mice bearing the haplotype H-2d showed specific IgG2a and IgG2b isotype response for all the preparations, which was statistically significant (P < 0.01) in both primary and secondary bleeds. The primary, secondary and tertiary bleed showed high levels of IgG2b for V3-gp41 and gp41 peptide in liposomes (with or without adjuvant) for the haplotype H-2q. Both IgG2a and IgG2b isotypes were detected in both alum and ISCOM preparations in all the haplotypes. Mice bearing the haplotype H-2q induced maximal levels of IgG2a and IgG2b antibodies for all the V3-gp41 peptide formulations in all the bleeds, which was statistically significant (P < 0.01) when compared with isotypes IgG1 and IgG3. P17 and p24 peptides too generated significantly high levels of IgG2a/2b isotypes both in liposomes (p < 0.01) and ISCOMs (P < 0.05) preparation in all the haplotypes. The levels of IgG2b isotype were significant (P < 0.05) as compared to IgG1 or IgG3 whereas the levels of IgG2a were more or less comparable with IgG2b for the liposome preparation in all the haplotypes except for mice bearing the haplotype H-2b strain. There was a significant increase in both the isotype levels (IgG2a/2b) in booster immunization for both the peptides. For p24 peptide, mice bearing the haplotype H-2k strain produced maximal levels of IgG2a and IgG2b than the mice of other haplotypes. The relative affinity (KD) of the antibodies raised against different preparations was assayed by measuring the dissociation constant(KD values) in high and low responder strain. (Table 2). Measurement of KD value by EIA in high and low responder strains of mice. The binding affinities of the antibodies raised against different peptide formulations as assessed by EIA procedure. The slope of the lines (KD values) was calculated by the regression analysis. True affinity of the antibodies was measured for different peptides in second bleed of all the formulations. A fixed dilution of antisera (1:500) was used with various molar concentrations of peptide antigen (10-7 M - 10-10 M). All the peptides generated high affinity antibodies in both the strains irrespective of the nature of the formulation used. Peptides entrapped in liposomes (with or without adjuvant) invariably generated high affinity antibodies as compared to alum and ISCOM preparations. The alum adsorbed preparations for V3-gp41 peptide elicited high affinity antibodies (KD-0.20 nM). The KD value observed for other peptides was in the range of (0.9 nM–24.5 nM). The KD values for liposome preparations were four to five folds lower viz. (0.10 nM–1.5 nM) as compared to the alum based preparations for V3-gp41, gp41 and p17 peptide when tested in both high and low responder strains. Five-fold increase in affinity was observed for p24 peptide liposome preparation when compared to alum formulation of other peptides. Addition of adjuvant further increased the affinity by 5–10 folds (0.05 nM–1.40 nM) depending on the nature of the formulations used for all the peptides tested. In general, V3-gp41 peptide had a lower KD (0.1 nM – 0.9 nM) as compared to KD values observed for other peptides was significantly high which was in the range of 3.5 nM – 24.5 nM. The MT-2 Cell line used was an HTLV-1 transformed human T-cell line generated from co-cultivation of cord blood lymphocytes and leukemic cells from a patient, which produces viral particles. MT-2 cells demonstrate a characteristic cytopathic response, which facilitates the observation of microplaques. Antiserum to be tested and Preimmune sera (PIS) were diluted three folds from 1:5 to 1:32805 and HIV MN was co-cultured with MT2 cells. Syncytia were counted in each of the respective well at different antisera dilutions. The average number of syncytia observed for each dilution was calculated and was expressed as percent of control. Neutralization of HIV-MNH9 strain in MT-2 clone alpha-4 cells by antiserum raised against V3-gp41, gp41, was observed (Fig. 3). 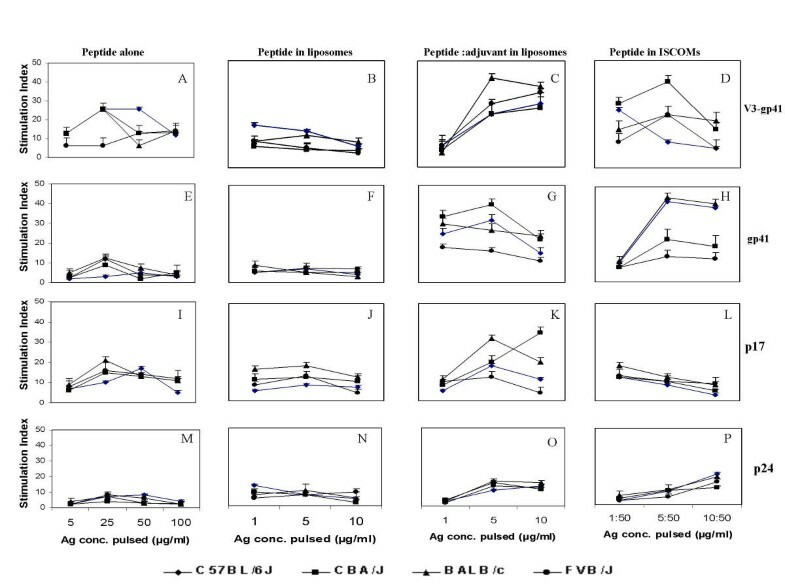 50% syncytia were inhibited at an antiserum dilution of 1:15 and 1:33 for gp41 and V3-gp41 peptide respectively whereas PIS did not showed any non-specific inhibition (Fig. 3). Greater than 90% of inhibition was observed at a dilution of 1:6 for V3-gp41 peptide and 1:5 for gp41peptide. HIV plaque neutralization by serial dilutions of antibody. Data were normalized as a percentage of the mean plaque count in 12 replicate control wells which was 10.4 and 13.1 for V3-gp41 and gp41 peptides respectively. High titer V3-gp41 peptide antisera was tested for the cross reactivity with various sequences of biotinylated V3 peptides derived from different clades of HIV by direct binding assays. For p17 and gp41 peptides one representative biotinylated peptide from HIV MN isolate was used for studies. Sera raised against V3-gp41 peptide showed high titers and cross reactivity with V3 peptides derived from clades A to G, MN, SF2, BR1 and BR2 isolates of HIV (Table 3). Antibodies raised against p17 and gp41 peptides also reacted with gp41 and p17 peptides derived from HIV-1 MN isolate thus indicating a spectrum of immunoreactivity HIV isolates with peptide formulations. Immuno-reactivity of biotinylated HIV peptides derived from different clades using mice antisera against V3-gp41, gp41 and p17 peptides. Immunoreactivity of biotinylated HIV peptides using mice antisera raised against different HIV peptides. Titer of antisera was defined as the reciprocal of dilution which gave a mean absorbance of 0.5. Run was considered invalid if negative control gave a mean absorbance > 0.5. * Titer of the antisera is defined as the reciprocal of dilution which gave a mean absorbance of 0.5. Run is considered invalid if negative control gave a mean absorbance ≥ 0.5. Though, most of the reported studies, antigen is immunized in CFA/IFA for priming the spleen cells, in our study, antigen was immunized in alum and taken as the experimental group. Standardization of antigen induced T cell proliferation was done using V3-gp41 peptide in alum and 5 μg of peptide antigen in liposomes (with or without 50 μg MA729) or in ISCOMs. The optimum dose, which showed the maximal T cell proliferation, was 50 μg/ml on 15th day with a single booster on 8th day. The above immunization schedule was subsequently used for other HIV peptides in different strains of mice under identical set of conditions. Data was expressed in Stimulation Index (SI). V3-gp41 peptide primed mice spleen cells when pulsed in vitro with the homologous antigen showed a moderate proliferation response in all the strains of mice (Fig 4A,4B,4C,4D). Stimulation with peptide in liposomes induced moderately high T cell response (SI 9.7–17.6) although the response was not statistically significant. Haplotype H-2d responded slightly higher but insignificantly (P > 0.05) as compared to other haplotypes when pulsed with the homologous antigen. Mice bearing the haplotype H-2k (SI-36.8) and H-2d (SI 39.4) significantly (P < 0.01) induced T cell proliferation compared to other haplotypes in adjuvant/liposome and ISCOM formulations. T cell response in Peptide-ISCOMs splenic cultures when compared with peptide:MA729 formulation in liposomes induced more or less similar SI and was statistically insignificant. T-cell proliferation obtained after addition of adjuvant MA729 along with V3-gp41 peptide (SI 22.3–36.8) in liposomes or incorporated in ISCOMs (SI 18–39.4) was the highest and was highly significant (P < 0.01) as compared to spleen cells primed and pulsed with V3-gp41 peptide alone or in liposomes. T-cell proliferation response for V3-gp41 (A-D), gp41 (E-H), p17 (I-L) and p24 (M-P) HIV-1 peptides. Mice of different haplotypes were primed with individual peptides and stimulated in vitro with peptide alone or in different antigenic formulations as described in materials and methods. For gp41 peptide all the haplotypes induced T cell stimulation in a dose dependent manner with maximal proliferation (SI-9.8–12.9) observed at 25 μg/ml for all the haplotypes except H-2b (Fig. 4E,4F,4G,4H). Liposome preparation induced maximal T-cell stimulation of H-2b haplotype as compared to H-2k,d&q and addition of adjuvant in liposomes along with peptide or in ISCOMs led to antigen specific stimulation, with H-2k being the strongest inducer. p17 peptide primed mice spleen cells when pulsed in vitro with homologous antigen induced moderate T cell proliferation in all the strains of mice tested (SI-11.6–20.2) (Fig. 4I,4J,4K,4L). p17 peptide produced comparative proliferative response when in vitro stimulated with different concentrations of peptide in liposomes for the haplotypes H-2k&q with the highest and lowest responses observed for H-2d and H-2b respectively. Surprisingly for p17 peptide inclusion of MA729 increased the T-cell stimulation (SI 18.4) only for mice bearing the haplotype H-2q, with low stimulation observed for haplotype H-2b,d&k (10.2–12.4). ISCOMs formulation led to a good T cell response (SI-32.1–35.9) which was statistically significant in mice bearing the haplotypes H-2d&k (P < 0.01) and in mice of haplotype H-2b (P < 0.01) or H-2q (P < 0.05) as compared to spleen cells primed and pulsed with peptide alone or entrapped in liposomes. For p24 peptide, mice bearing the haplotype H-2q showed the highest T-cell stimulation (SI-7.6) though statistically insignificant (P > 0.05) than mice bearing the haplotypes H-2b,d&k when pulsed with homologous antigen (Fig. 4M,4N,4O,4P). However inclusion in liposomes led to same degree of T-cell stimulation for all the haplotypes studied. For p24 peptide adjuvant liposome constructs maximal T cell response (SI-19.7 & 18.3) was obtained in mice bearing the haplotypes H-2b&d which was highly significant (P < 0.01) as compared to spleen cells pulsed and primed with p24 peptide alone or in liposomes. Entrapment in ISCOMs elicited significantly high T cell proliferation (SI-13.4–15.6) (P < 0.05) as compared to spleen cells primed and pulsed with p24 peptide studied in all haplotypes. The T cell response for peptides in different formulations was similar in both the haplotypes when studied by cocktail approach (Fig. 5A). In case of stimulation with peptide in liposomes, V3-gp41 was found to induce the maximum stimulation index in mice bearing the haplotype H-2k (SI-9.9) and in H-2d (SI-4.5) mice. With ISCOM delivery of the stimulating peptide, the trend in stimulation index was same but significantly higher for V3-gp41 (SI-18.7) and gp41 (SI-19.8) in H-2k mice. Similarly, inclusion of adjuvant along with peptide in liposomes generated very high responses in both the haplotypes. Estimation of T-cell response using cocktail approach (A) for different HIV-1 peptides. Mice were immunized with cocktail and in vitro stimulated with respective peptides alone or in adjuvant formulations. Effect of MA729 on T-cell stimulation in mice primed with adjuvant MA729 (B). To look for the mitogenic activity of adjuvant MA729, mice bearing the haplotype H-2d was immunized with 50 μg of the above adjuvant on day 0 and 8th and spleen cells were subsequently harvested on day 15th (Fig. 5B). The spleen cells were stimulated in vitro with V3-gp41 peptide alone or in liposomes (with or without adjuvant) and adjuvant MA729 (alone or in liposomes). Spleen cells pulsed with V3-gp41 peptide (alone or in liposomes) showed negligible levels of T cell stimulation with SI of 2.9 and 2.1 respectively. However stimulation with V3-gp41 peptide along with adjuvant entrapped in liposomes induced significantly high (P < 0.01) T cell stimulation with SI of 8.3 as compared to response observed for spleen cells pulsed with peptide alone or in liposomes. Stimulation of MA729 primed spleen cells with MA729 alone or in liposomes also induced a very high T cell stimulation with SI of 7.2 and 8.1 respectively indicating a strong mitogenic activity of MA729, which is further enhanced by inclusion in liposomes. Standard curves for IL-2 (0–1000 pg/ml), IFN-γ (0–12000 pg/ml), IL-4 (0–1000 pg/ml) were plotted and cytokines were measured in culture supernatants obtained during T cell stimulation assays (Table 4). The culture supernatants obtained from spleen cells primed and pulsed with V3-gp41 and gp41 peptides induced moderately high levels of cytokines as compared to p17 and p24 peptides. Cytokine levels for various peptides in different haplotypes. Cytokine levels as measured for various peptide formulations in different haplotypes. The value represents the level of cytokines obtained from wells pulsed with the optimal antigen (peptides alone or in adjuvant systems) concentration which showed maximal T-cell stimulation index). The value represents the level of cytokines obtained from wells pulsed with the optimal antigen (peptides alone or in adjuvant systems) concentration which showed maximal T-cell stimulation index. H-2d haplotype induced highest levels of IL-2 (372 ± 10.2 pg/ml) for V3-gp41 peptide. High levels of IL-2 were also quantitated (390–445 pg/ml) in haplotypes H2 k,q&b for gp41 peptide. The levels of IL-2 obtained for p17 and p24 peptides were also comparable within strain to strain (183–360 pg/ml). In vitro stimulation with peptides entrapped in liposomes was slightly higher and was found to be statistically insignificant (P > 0.05). Highest levels of IL-2 (489–821 pg/ml) were obtained in culture supernatants from spleen cells stimulated in vitro with peptide:MA729 in liposomes. Haplotype H-2d responded the best for all the peptides except p17, with V3-gp41 peptide inducing the highest levels (821 ± 29 pg/ml). IL-2 levels were found to be statistically higher (P < 0.01) when stimulated in vitro with ISCOM formulations. 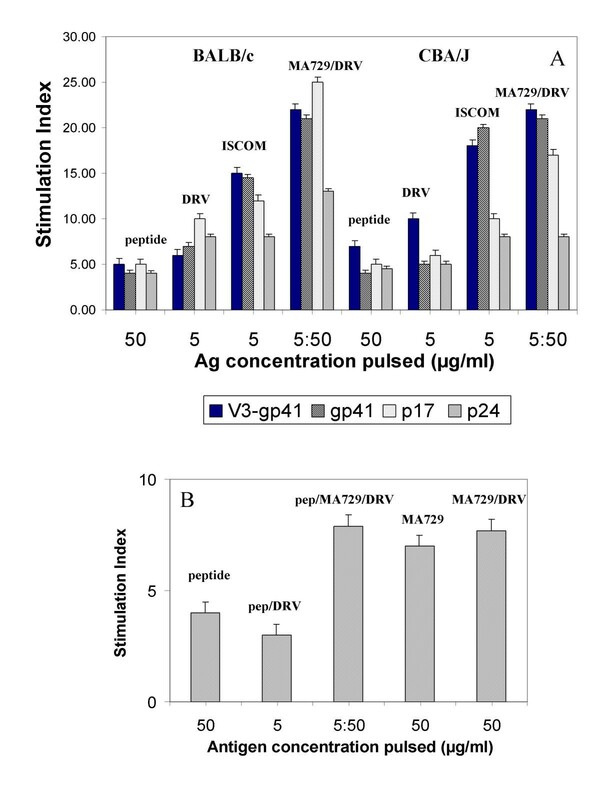 Mice of halpotype H-2k responded best for V3-gp41 and gp41 peptides, whereas H-2b and H-2q induced the highest stimulation for p17 and p24 peptides respectively. The production of IFN-γ in culture supernatants of V3-gp41 and p17 primed and pulsed spleen cells were comparable and had low to moderately high levels of (311–727 pg/ml) for the haplotypes H-2d,k&b whereas mice of haplotype H-2q induced the highest levels (878 ± 28.9 pg/ml) for V3-gp41 peptide. Moderately low levels of IFN-γ were induced for gp41 and p24 peptide in all the haplotypes studied. IFN-γ was substantially increased (786–1362 pg/ml) when the cells were stimulated with peptide entrapped in liposomes. The increase was however not statistically significant (P > 0.05) as compared to stimulation with homologous peptides except in haplotype H-2q for gp41 peptide (P < 0.05). Significantly high levels were observed in peptide:MA729 stimulated splenic cultures. Inclusion of MA729 in liposomes significantly (P < 0.01) enhanced the levels without any strain-to-strain variation. Highest IFN-γ levels were detected in peptide ISCOMs stimulated formulations. All the haplotypes produced high levels of IFN-γ for all the peptides except for mice bearing haplotype H-2d for p17 peptide. 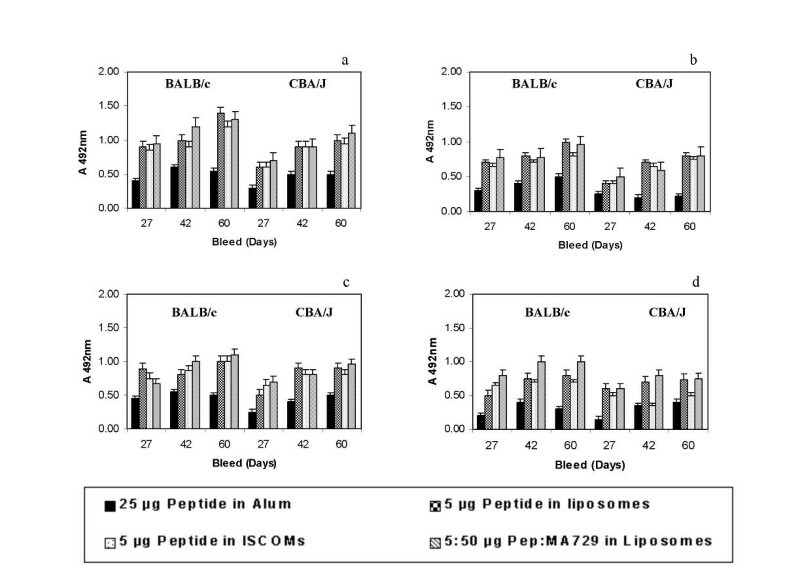 Very low levels of IL-4 were induced for all the peptide formulations and were comparable with the baseline levels (27 ± 3.9 pg/ml) except for the liposome preparations where IL-4 were found to be slightly above the base line levels, but were in very low amounts as compared to other cytokines (Table 4). 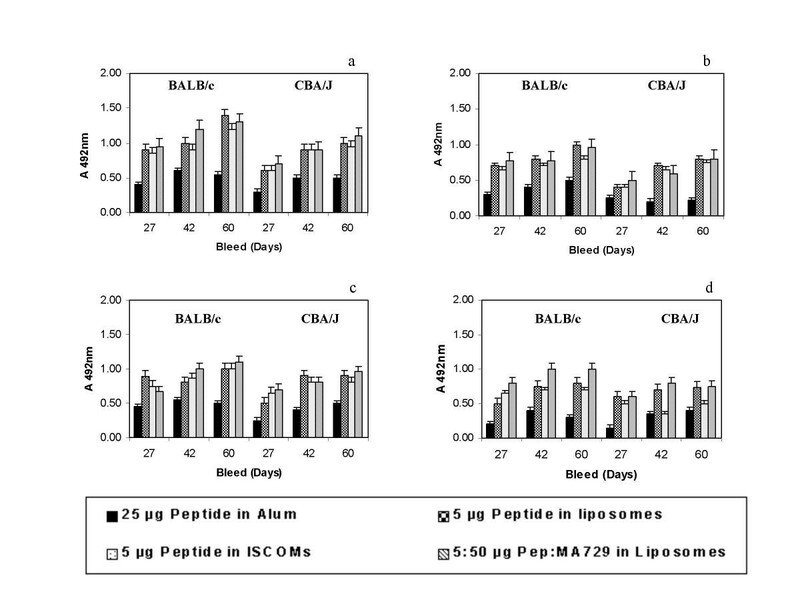 Culture supernatants obtained from peptide primed spleen cells stimulated in vitro with peptide in liposomes induced high levels of IL-2 (337–492 pg/ml) (Table 5). Higher levels of IL-2 were obtained for peptide entrapped in ISCOMs (428–654 pg/ml). Spleen cells stimulated in vitro with peptide entrapped along with MA729 in liposomes induced the highest levels of IL-2 (389–635 pg/ml). Low levels of IL-4 were induced (11–69 pg/ml for H-2d & 17–61 pg/ml for H-2k) when the spleen cells were pulsed in vitro with various peptide formulations. The levels were comparable to the baseline levels. Peptide primed spleen cells stimulated with peptide alone or entrapped in liposomes (with or without MA729) or entrapped in ISCOMs also induced very low levels of IL-2 in both the haplotypes. The levels of IFN-γ were found to be higher for V3-gp41 (623 ± 53 pg/ml) and gp41 (589 ± 54 pg/ml) peptide as compared to p17 (453 ± 71 pg/ml) and p24 (411 ± 40 pg/ml) peptide. Peptide entrapped in liposomes when used to pulse the spleen cells primed with cocktail peptide in alum induced high levels of IFN-γ (977–1089 pg/ml) for mice of haplotype H-2d as compared to haplotype H-2k (933-89 pg/ml). This feature was observed for all the peptides. Peptide entrapped in ISCOMs also induced high levels of IFN-γ (1060–1543 pg/ml) for H-2d and (1031–1311 pg/ml) for H-2k. The highest level of IFN-γ were obtained for V3-gp41 peptide pulsed formulation in liposomes along with the adjuvant (1601 ± 153 pg/ml) for the haplotype H-2k. IL-2 levels when estimated in culture supernatants were found to be higher for V3-gp41, gp41 and p17 peptides as compared to p24 peptide. The levels were found to be same when tested in both high and low responder strain. Cytokine levels for various peptide formulations by cocktail approach. Cytokine levels as measured for various peptide formulations generated by cocktail approach (The value represents the level of cytokines obtained from wells pulsed with the optimal antigen (peptides alone or in adjuvant systems) concentration which showed maximal T-cell stimulation index for mice primed with cocktail of peptides. The value represents the level of cytokines obtained from wells pulsed with the optimal antigen concentration (peptides alone or in adjuvant systems) which showed maximal T-cell stimulation index for mice primed with cocktail of peptides. Peptides often elicit low-affinity antibodies and have limited ability to generate uniform immune response in an outbred population. We demonstrate that the peptides used in the present study were immunogenic in different strains of mice tested with minimal strain-to-strain variation with the production of high affinity cytophillic antibodies. V3-gp41 peptide was designed in such a way so that there is synergistic effect of both the domains, activation of specific T cell help and neutralization of wild type isolates. The study validates the superiority of hybrid peptide sequences in accordance with the study in which synthetic peptides containing T and B cell epitopes from HIV env gp120 [peptide hybrid between V3 loop (303–321) and T cell sequence (428–443)]  was used. Previous report from our lab showed that a dimer of V3 loop or gp41 peptide administered in CFA/IFA could induce high antibody response . Moreover recently we demonstrate the role of polytuftsin in enhancing the immunogenicity of HIV peptides . The antibody response to p17 peptide was lower as compared to envelope peptides, but the pattern of response seen with different delivery systems was more or less similar. p24 peptide generated a relatively lower response as compared to the other peptides studied. Several B-cell epitopes within this region have been mapped including B-1 (KEPFRDYVD) and B-2 (RFYKTLRAE) . Thus HIV candidate vaccine including gag regions in addition to envelope proteins might be more effective than those based on envelope region alone. All peptides when encapsulated in liposomes or ISCOMs induced sustained antibody responses. Similar results have also been reported by several other authors in which encapsulation of protein/peptide antigens with adjuvants in liposomes have led to induction of strong antibody responses . Several reports from our lab also confirm these findings with CS protein of Plasmodium vivax [25–27]. The adjuvant effect of ISCOMs is attributed to the presence of Quil A which brings about direct B cell activation, which augments antibody responses against T cell independent antigens . ISCOMs containing natural or recombinant palmitified gp120 has also shown to induce ten times higher antibody titers as compared with CFA [29, 30]. The present study also demonstrates the elicitation of protective isotypes IgG2a and IgG2b against various peptide formulations. Although alum adsorbed formulations are known to produce IgG1 isotype during primary response an additional IgG2a/2b response was stimulated. The entrapment of peptides in aqueous compartments of liposomes induces isotypes IgG2a and IgG2b  and the presence of adjuvant [Thr1 MDP] and metabolizable saponins such as Quil A enhances IgG2a production . IgG2a subclass immunoglobulins are important in the defense against virus infection in which opsonisation and complement mediated lysis of virus and destruction of virus-infected cells by ADCC may be of great importance. IgG2a antibody is more effective than IgG1 antibody for fixing complement . It is also most effective subclass for the activation of macrophages and natural killer cell antibody dependent cellular cytotoxicity whereas IgG1 has very limited activity. In the present study the determination of contribution of individual components of cocktail peptide was done and compared with the results obtained with single-antigen immunization strategy which demonstrates a very good example of peptide competition with MHC molecule in a pool of sequences, picking up matched epitope with optimal affinity rendering these two sequences highly immunogenic. As a first step towards generation of vaccine against HIV, we have demonstrated the efficacy of cocktail of several of HIV synthetic peptides in the generation of powerful humoral response using mice as an animal model. Generation of high affinity antibodies is of advantage as they are more effective in virus neutralization. Both high and low responder strains produced antibodies of comparable affinity. When the antigen was administered along with adjuvant, an inverse relationship was observed between antigen dose and antibody affinity , which correlates with our present findings, based on low dose immunization. The findings are also well correlated with the high affinity antibodies raised in CFA with protein antigens as compared to delivery in saline. Adjuvants influence affinity through process of cell selection by antigen via effects on macrophages or directly preferentially stimulating a particular subset of B cells which produce high affinity antibody or enhance mutation in B cells to produce receptors of high affinity . The present study also demonstrates that env and gag peptide constructs are capable of inducing neutralizing antibodies, which are effective against lab-adapted, although the effect on primary isolates was not studied which would be interesting to perform. V3-gp41 peptide antiserum inhibited the formation of syncytia in both MT-2 cells. Antiserum raised against gp41 peptide (727–753) inhibited the syncytia formation in both MT-2 and Sup-T1 cells. This may be attributed to interference in the virus cell interactions as gp41 envelope antigen is involved in membrane fusion following the binding of virions to the CD4 receptor molecule. It is thus tempting to speculate that anti-gp41 antibodies may therefore block viral cell membrane interaction either at the cell surface or in the endosomes. We observed cross reactivity of mice antiserum to linear V3-peptides from HIV clade B that is probably of limited importance. Moreover HIV immune sera from many sources appear to broadly cross-react with linear V3 sequences and this has not translated in to functional antibody activity. Primary isolates are generally more resistant to neutralization by immune antiserum and monoclonal antibodies than laboratory adapted viruses , although certain monoclonal antibodies can be potent neutralizers of both types of viruses. Cell mediated immunity, involving helper T cell and CTL responses plays a crucial role in acute HIV infection. In this study we have examined the potential enhancement of cellular immunity against HIV-1 by immunomodulating the specific immune response to different synthetic peptides derived from HIV antigens through the co-delivery of an adjuvant MA729. We present the immunogenicity of synthetic peptide approach with immunoadjuvants like MA729 for elicitation of cross-reactive T-cell proliferative responses. Moreover these immunogens induced high tittered antibodies as described in the previous section. To investigate the cellular response to different peptide sequences (V3-gp41, gp41, p17 and p24), four different inbred strains of mice were immunized under identical set of conditions. The dose of peptide used for immunizing animals was kept same as was used for studying the humoral response. All mice of different haplotypes showed higher in vitro T cell proliferation with peptides V3-gp41 and gp41 as compared to p17 and p24 peptides (Fig. 4). A study  has demonstrated in vitro that a gp41 peptide (584–609) that spans the entire length of our gp41 peptide (589–609) had the potential to associate spontaneously in vitro with diverse class I and class II HLA molecules. Gp41 peptide (727–753) also provided good degree of immunostimulation. It has been shown that the region spanning residues 737–749 (GIEEEGGERDRDR) stimulates PBMC's from HIV seropositive individuals and acts as a strong T-cell epitope . We reasoned that peptides entrapped in liposomes (with MA729) or in ISCOMs are able to stimulate T-cells of most haplotypes of mice and hopefully also T-cells of humans of many HLA types. As it was observed that the inclusion of adjuvant MA729 in liposomes with peptides significantly enhanced T-cell stimulation, it highlights the mitogenic role associated with the adjuvant for induction of strong T-cell proliferation responses. The observed effect of MA729 could be linked to MDP, which is known to activate macrophages and leukocytes , enhance chemotaxis and phagocytosis [40, 41] or by enhancing carrier specific T cell function. ISCOM based vaccines have also been used and tested with V3-loop peptide derived from HIV-2 for long standing protection against cell free HIV-2 . The observation in the present work are in conformity with earlier reports in which ISCOM borne antigen induced an enhanced cell mediated response [43, 44]. The results of cocktail studies obtained signifies the potential of V3-gp41 and p17 peptides as putative T cell epitopes for induction of strong cell mediated immunity as compared to gp41 and p24 peptides when tested by cocktail approach. Cytokines play an important role in determining the outcome of immune responses to infectious agents by differentially affecting IgG isotype . In the acute stage, Th1 like immune responses (IL-2 and IFN-γ) enhance cellular immunity to control the infection whereas in the chronic stage, Th2 immune responses (IL-4 and IL10) down regulate the effector immune responses, helping the organism to persist in the body . Also the balance between Th1 and Th2 activities determine the course of many infections . The results obtained in the present study show that peptide when entrapped in liposomes (with adjuvant) or in ISCOMS induced higher levels of IFN-γ and IL-2 followed by liposome preparations which induced moderate levels of IFN-γ and IL-2, whereas all the peptides adsorbed on alum alone produced low levels of IFN-γ and IL-2 (Table 4). IL-4 however when measured in culture supernatants was detectable near the baseline levels. It is postulated that peptide in liposomes may be activating cells of Th1 type resulting in high levels of IFN-γ and IL-2, as seen during in vitro studies. MDP analog may be internalized by T cells and stimulate the transcription of cytokine genes in activated T cells. Culture supernatants from spleen cells primed and pulsed with all the antigen preparation showed elevated levels of IL-2, IFN-γ whereas IL-4 levels seen were very low and were comparable to baseline levels. The secretion of IFN-γ by env and gag epitope stimulated Th cells suggests that the formulation elicit Th1 like immune responses. IFN-γ has also been shown to have synergistic anti-HIV properties in vitro . HIV env-triggered release of these cytokines (IL-2 and IFN-γ) may be beneficial in containing HIV-1 replication in vivo. Also, preliminary evidence generated, in studies of vaccinated non-human primates suggest that a vigorous Th cell response including viral antigen specific IFN-γ production may be an immune correlate of protection from HIV-1 and simian/human immune deficiency virus infection . One can imagine several strategies to skew the response to a vaccine towards Th1 like responses with use of adjuvants like MA729, which is correlated with earlier studies . The findings are also well correlated with work carried out previously in our lab in which linking of IL-1β  or polytuftsin to HIV peptides preferentially augmented Th1 like response with induction of IFN-γ and IL-2. The vaccine immunogen used in the present study has been tailored to stimulate the most relevant response with the use of chimeric V3-gp41 antigen and location of new neutralization sites. In addition, the above approach could be tested in non-human primates for protective efficacy. Although this study doesn't provide definitive evidence, it is however likely that the sequences tested may bind promiscuously to different H-2 alleles and thereby overcome MHC restriction. Moreover, in view of the earlier findings that very low doses of antigen preferentially induces DTH responses in absence of antibody , it has been proposed that immunization with low dose antigens might steer the response towards a Th1 like pattern rather than Th2 like pattern in the prophylactic vaccine against AIDS . All Experiments including peptide synthesis and immunoassays were carried out by Dr. Lokesh Agrawal. Dr W Haq supplied the adjuvant MA729 and Dr Carl Vieth Hanson helped in performing the in vitro syncytia assays and peptide binding assays in his laboratory. Dr D N Rao helped in designing the study and critically reading the manuscript. Financial support from Department of atomic energy (DAE) and Council of Scientific and Industrial Research (CSIR) as Senior Research Fellowship to Dr. Lokesh Agrawal is gratefully acknowledged. The authors also thank Anjali for her valuable comments on improving the style of the manuscript.